The best Christmas for any basketball fan yesterday was the return of the NBA. The only thing that could have made it better for Boston was watching the C’s come out of New York with a win. Unfortunately, we all know how that played out. Losing to the Knicks, especially with their all-star elf Spike Lee jumping up and down courtside, is always tough to swallow. But not all was lost in New York for the Celts. I think it’s safe to thank Danny Ainge for holding on to Rondo, even if he didn’t mean to. Throughout the short preseason, we could see improvement in Rondo’s shot and overall play, but yesterday he made a statement. His stats were amazing, with 31 points and 13 assists, while almost single handedly bringing the Celtics back into the game, but his aggressive manner and matured nature of play is what shone through the loss. 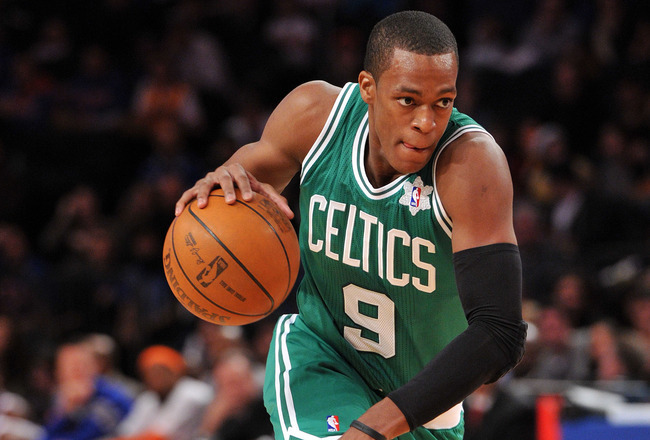 With an aging team, Rondo is the key to the Celts this season. If he can continue to play like a first team all-star, the Celts are going to be alright this season. Not to mention having guys like Brandon Bass slip on a green and white uniform and make a statement of his own. He ended the day with 20 points and 11 rebounds, letting everyone know which team got the better deal in Orlando trade. Bass coming off the bench is going to prove to be a great addition to the Celtics squad, both offensively and defensively. Bring Pierce back and throw Mickael Pietrus into the mix, I think the C’s are going to be just fine. This entry was posted in Celtics and tagged brandon bass, celtics, christmas, knicks, nba, rondo, spike lee by jtulz07. Bookmark the permalink.